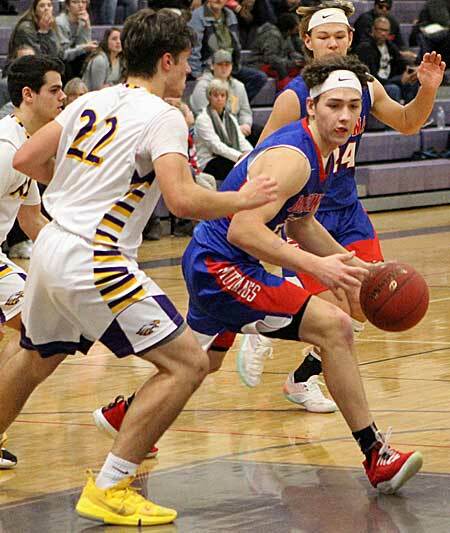 Photo by Cheryl Wertman – Medina’s Nate Sherman, shown here driving against Albion’s Michael DiCureia, and his Mustang teammates look to lockup outright possession of the Niagara-Orleans League title with a win over Akron on Tuesday. Having already clinched at least a tie for a school record fourth straight Niagara-Orleans League championship, Medina takes aim at claiming outright possession of the crown as the Mustangs host Akron on Tuesday at 6:30 p.m.
Medina is currently 10-0 in N-O competition (15-3 overall) and two games ahead of runner-up Wilson (8-2) with two games remaining. The Mustangs will close out the N-O campaign on Thursday at Wilson which visits Roy-Hart on Tuesday. During this current title run, Medina captured the N-O crown outright during both the 2015-16 and 2016-17 seasons and shared the crown with Newfane last year at 10-2. Lyndonville, which has already locked up the Genesee Region League Division 2 title, will host Kendall at 7 p.m. Monday to close out the league campaign. The Tigers are 11-2 in the league and 16-2 overall. Kendall, which is 5-7 in the league and 8-10 overall, has won five of its last eight games after a slow 3-7 start to the season. Boys Basketball: Rochester Prep at Holley, 5:30 p.m.; Albion at Akron, Kendall at Lyndonville, 7 p.m. Girls Basketball: Akron at Albion, Kendall at Notre Dame, Barker at Holley, 7 p.m. Boys Basketball: Akron at Medina, Barker at Newfane, 6:30 p.m.; Wilson at Roy-Hart, 7 p.m. Girls Basketball: Medina at Akron, Newfane at Barker, 6:30 p.m.; Kendall at Lyndonville, Holley at Alexander, 7 p.m. Boys Basketball: Holley at Alexander, 7 p.m.; Finney at Lyndonville, 7:30 p.m. Girls Basketball: Finney at Lyndonville, 4:30 p.m. Boys Basketball: Medina at Wilson, 6 p.m.; Roy-Hart at Barker, 6:30 p.m.; Newfane at Albion, Notre Dame at Kendall, 7 p.m. Girls Basketball: Albion at Newfane, 6:30 p.m.; Barker at Roy-Hart, 7 p.m. Girls Basketball: Nardin at Medina, 7 p.m. Boys Basketball: Buffalo Science at Albion, 12:30 p.m.